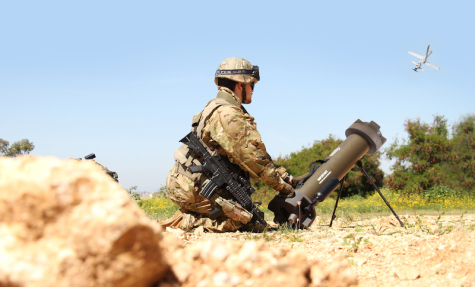 UVision Air Ltd. has successfully demonstrated two of its leading HERO systems: the multi-purpose warhead and extended-range Hero-400EC and the high-precision, light-weight man-pack portable Hero-30. The demonstration, which took place in the customer's home-base in front of high-ranking officers, proved the high precision strike to the target, the tracking and lock-on capabilities of the system on a vehicle in various operational scenarios, mission-abort capabilities & parachute recovery. The HERO family is comprised of seven loitering munitions systems (Hero-30, Hero-70, Hero-120, Hero-250, Hero-400EC, Hero-900, Hero-1250), designed for different missions at various ranges using warheads of various types. The HERO systems enable forces in the front-line to independently locate time sensitive targets, track and attack with pin-point precision to handle different missions ranging from light-weight static or moving targets (such as light-duty vehicles and human targets) to larger fortified or heavily armored targets such as MBT (Main Battle Tank) and other strategic objectives. The HERO systems may also be provided in ISR configuration, allowing the use of the platform as a means of gathering intelligence. The HERO family can carry out pinpoint strikes in urban areas or remote locations, with minimal collateral damage. In cases where an attack is aborted, the systems can be recalled and another target selected. With extremely low noise and thermal signature, these systems integrate highly advanced, stabilized electro-optic day/night cameras, and are ideal for deployment from air, land and sea. UVision designs, develops and manufactures smart, innovative, cost-effective, lethal aerial loitering systems for customers worldwide. With cutting-edge technology backed by over 30 years of extensive field experience, the company bases its systems on unique aerodynamic platform configurations that meet the requirements of today’s new battlefield doctrines for combat operations in complex, dynamic environments.